I really really missed the Japanese mochi a lot, so when I found it for sale I immediately grabbed a pack! Some of you may not know what I'm talking about. Mochi is a Japanese rice cake, commonly consumed during the New Year, made of glutinous rice pounded and molded into round shape. 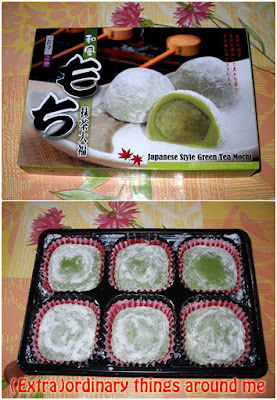 There're various assortments, I love all of them but this time I fuond the green tea flavoured ones. 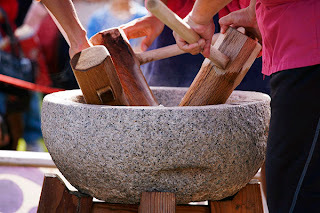 I'm going to show you a picture of the preparation of traditional mochi below. 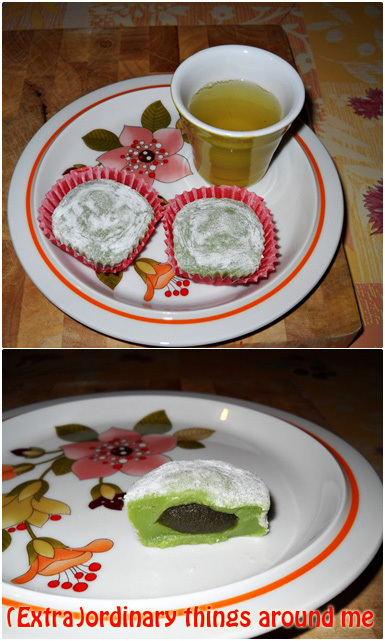 Japanese mochi is well-known and eaten in Thailand too. Italian people might not like these kinds of dessert much, seeing from my family, they don't like any kinds of our sweet made of glutinous rice.